Hey everyone. 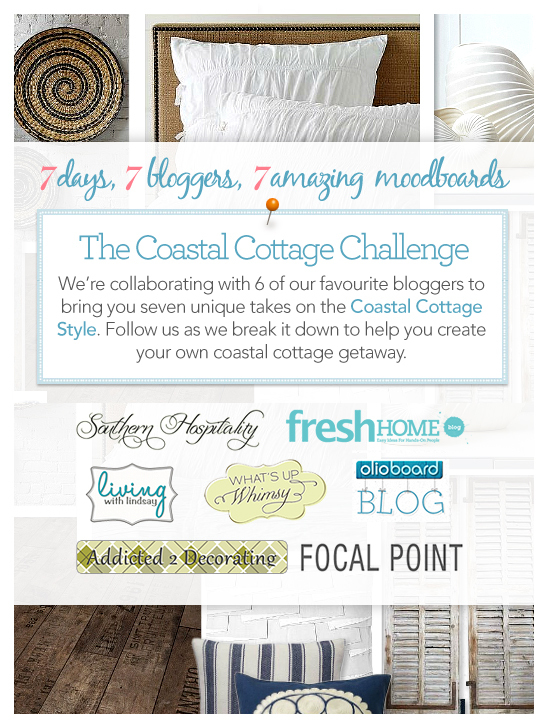 Starting Monday the 15th we’re collaborating with 6 of our favourite bloggers to bring you the Coastal Cottage Challenge. Each blogger picks a room in the cottage to design and a day of the week to post about it. We’re bringing you seven completely different takes on the Coastal Cottage Style. I can’t wait to see what we all come up with. Follow along to learn great tips and tricks for pulling off this sea side look. About Lynda: Lynda has done it all. She’s choreographed and styled fashions shows for Seventeen magazine, shops in Coconut Grove and for clubs in South Beach. She’s done window design, prop construction and styled window displays. She’s an interior designer who can help you on something as small as getting organized to decorating for a season or occasion all the way up to a major renovation. Her experience and passion for interiors make her blog a must for ideas and inspiration. About Lindsay: Lindsay, is a DIYer and home decor crafter with a zeal for budget decorating. She’ll see a great item in a store or online and create it at a fraction of the cost. If you’re creative hands are itching for a great project, follow Lindsay. She’ll point you in the right direction and give you all kinds of tips to help you out. About Rhoda: Rhoda started her blog back in 2007 on a whim. A lover of old things, vintage and worn objects, her blog is one beautiful image after the next of personal projects and amazing finds. If you’re like Rhoda and love putting in the extra effort to make a house a home, look no further. This blog has you covered. About Kristi: Kristi is a professional interior decorator by day, and a DIY fanatic and slightly obsessed blogger by night. In her blog she shares glimpses into her projects, whether they’re for clients or for her own home. Check out her blog for new interior decorating ideas, decorating tips, helpful articles, stunning photos, and great step by step instructional guides. About Shannon: Shannon Fitzpatrick is a lover all things design, whether it’s design in the home or event design . She describes her style as “contemporary whimsy, with a hint of vintage”. What’s Up Whimsy is an extension of those two loves and a place for you to find loads of inspiration. About Rachel: FreshHome’s design blog, is a spot where the editors of FreshHome Magazine post their favorite design ideas, products and how-tos. Rachel is the online editor of Fresh Home. She’s always got a great project up her sleeve, whether she is rehabbing a dresser found on Craigslist for less than $20, or painting (and repainting) a room until she’s found the winner out of 80 different shades of blue-gray. About Sheilah: I run a small web design company with my partner creating large scale social sites and web and mobile apps for our clients. Olioboard was our first attempt at creating our very own app. They say you should start with something you love and I LOVE interior design. Olioboard was created to help others (like me) experiment with their interior design side. For everyone who enjoys spending hours browsing home decor stores, dreaming of new bathrooms and kitchens over cars and clothes… Olioboard was made for you. Enjoy!